When a person’s job involves uncovering state secrets and conducting covert action to protect national security, where does ethics come into play? That was the question at the heart of a symposium, “Double Lives and Moral Lives: An Exploration into the Ethics of Intelligence,” held Nov. 8 at The Catholic University of America. 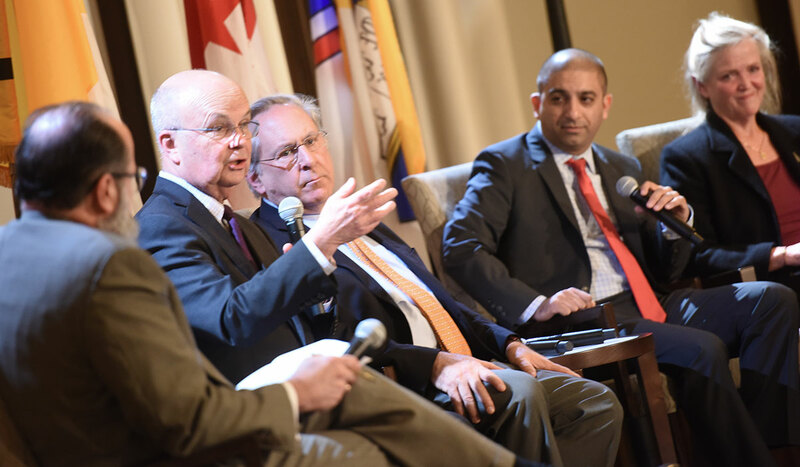 Former CIA director Michael Hayden was the main speaker at the event, which was co-sponsored by the University’s Intelligence Studies Program and the Institute for Human Ecology. Additional panelists included David E. Hoffman, a contributing editor at The Washington Post; V. Sue Bromley, a former executive director of the CIA who worked at the agency for 31 years; and Jamil Jaffer, the founder of the National Security Institute who currently serves as director of the National Security Law and Policy Program at George Mason University in Fairfax, Va. When it comes to ethics, Dujmovic said, the intelligence community must hold itself to the same standards and values held by the American people. That idea was repeated by Hayden, who said intelligence officers are often faced with tough ethical decisions about which actions to take, keeping in mind the safety of sources and innocent bystanders. When faced with life-and-death decisions, Hayden said intelligence officers rely on principles taken from Catholic Just War Theory, asking themselves if the action is necessary, proportional, directed at the correct people, and in service of humanity. As the conversation continued, the panelists discussed many issues facing the intelligence community in recent years, including the controversies surrounding extreme interrogation techniques like waterboarding and the widely discussed leaks of information from people like former CIA employee Edward Snowden and former U.S. Army soldier Chelsea Manning. The panel also discussed the relationship between intelligence officers and journalists, saying the two professions have a mutual distrust, but should find a way to work together to promote an open and free society. “Our country will be safe because of people like you,” she said.